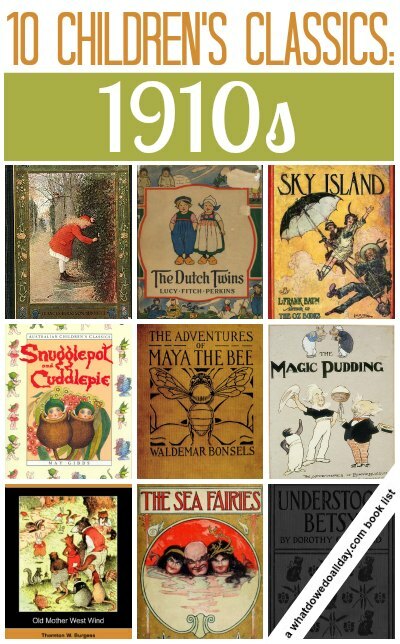 Continuing on with my series on 20th Century Classic Children’s Books we move now to the 1910s. I’m happy to report that this list has a few well-known favorites as well as several books I think will be new to you. 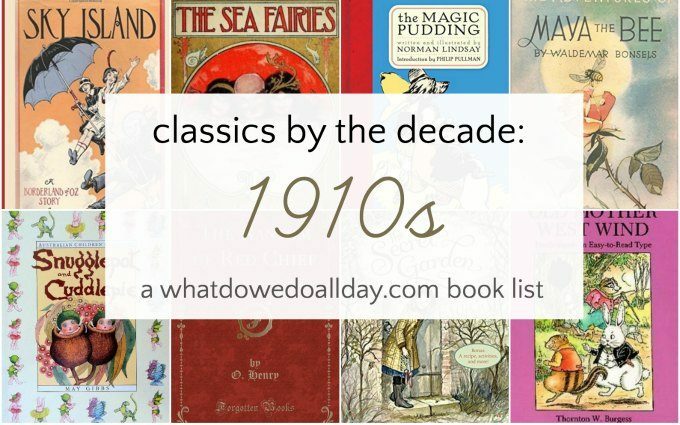 As we move forward through the century I will continue to have a wider selection of classic books from which I can choose! 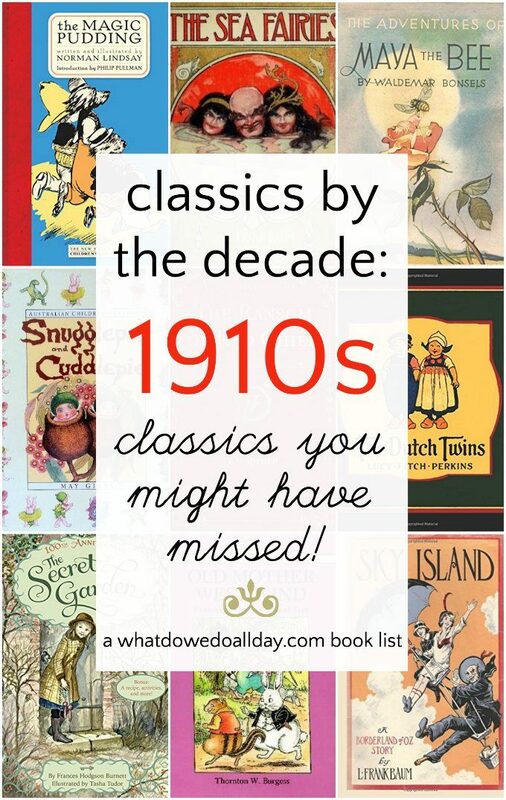 I curated a list with 1910s titles from books from America, Europe and even Australia. Pollyanna by Eleanor H. Porter. (1913) When I was a kid I considered the Haley Mills Pollyanna movie to be a masterpiece and the movie was the reason I picked up the book. Even a cranky old curmudgeon can’t resist a girl who is genetically programed to be unrelentingly, illogically and unreasonably optimistic every single day. The Magic Pudding by Norman Lindsey. (1918) I think this quirky Australian classic works best as a read aloud. A penguin and a koala join forces with a sailor and a walking, talking pudding-in-a-bowl who never disappears no matter how much of him you eat. As you might expect, crazy, laugh-out-loud adventures follow. Sea Fairies (1911) and Sky Island (1912) by L. Frank Baum. I’m going to cheat a bit and include two titles under one heading. The author of The Wonderful Wizard of Oz wrote these engaging fantasy stories. Trot and Cap’n Bill, a sailor with a wooden leg, have magical adventures, first underwater and later among the clouds. Trot and Cap’n make appearances in later Oz books. Old Mother West Wind by Thornton Burgess. (1910) Gentle and humorous tales about anthropomorphized animals. I loved Burgess’s animal stories when I was a kid. I remember the long library shelf of red-spined Burgess stories I adored checking them out and finding new ones I hadn’t read yet. Your family will get addicted to his books. Tales of Snugglepot and Cuddlepie by May Gibbs. (1918) I must admit I find this Australian brand of children’s books fun, but in a very weird sort of way. Tiny gumnut brothers live in the Australian bush and have strange adventures. Unfortunately, this title is hard to find in America, but check your local library or search out a used copy. Understood Betsy. (1916) Eleanor Roosevelt named author Dorothy Canfield Fisher as one of America’s ten most influential women. Educators will recognize her as the woman who introduced the Montessori method to American classrooms. That philosophy is recognizable in Understood Betsy. Until she goes to live on a rural homestead with her cousins, nine year old Elizabeth has “never found out a single thing for herself alone.” In the country, she takes joy and pride in learning and becomes a very capable and happy Betsy. The Dutch Twins by Lucy Fitch Perkins. (1911) Six sweet stories about 5 year old twins, Kit and Kat, who live in rural Holland. Adventures range from digging their own worms for fishing, taking the milk to market and meeting Saint Nicolas. There are a lot of dated gender attitudes in this book, though! If you enjoy this book Lucy Fitch Perkins wrote a slew of Twins stories, from The Cave Twins to The Belgian Twins. The Secret Garden by Frances Hodgson Burnett. (1911) It’s kind of interesting all the classic books about orphans who make the world around them shiny-happy, no? Orphan Mary Lennox tends a secret garden and in doing so the dispirited personalities of her uncle and cousin start to bloom as well. The Adventures of Maya the Bee by Waldemar Bonsels. (1912). Told in naturalistic detail, this German story about a young bee who leaves her hive in search of adventure explores the ideas of individual versus collective identity, loyalty, loss and courage. Maya is a well known character in her native Germany and not nearly well-known enough over here. “The Ransom of Red Chief” (1910) This is a short story by classic American author, O. Henry. Two men think kidnapping a boy will earn them a healthy ransom from his wealthy father. The mischievous boy, however, turns out to be more than a handful. A hilarious tale. Note, the link above is to a book with other stories, as well. « Learn Basic Chess Skills with These Two Games! I love these lists you are putting together. I was also excited to see some Australian classics on the list too. My task for tonight is to finish a post I'm writing on two newly released Snugglepot and Cuddlepie picture books. So I mentioned Nils to my German husband the other day and he got all excited because it was his favorite book in his childhood. He went and got an HTML version and reformatted it much more nicely for the Kindle. Now I expect he will go crazy for Maya 🙂 I remember reading The Ransom of Red Chief as a teenager (translated, of course) and rolling on the floor in laughter. what a great list! I grew up in Germany and loved Maya so much!Thanks for sharing. A great list – especially for my Aussie/German family! I grew up with The Magic Pudding and Snugglepot and Cuddlepie and my husband with Maya the Bee (I didn't even know there was an english translation of this!). Would you class 'Daddy-long-legs' as a children's book? I loved it when I read it as a child but probably a lot of it went over my head. I re-read it lots of times as a teenager and an adult and still really love it today. Everyone might be interested to know that there is a German book on next week's list, too! Oh my goodness, thanks for such great suggestions! The Twins book and the one about the koalas are *exactly* the kind of story my daughter enjoys most at the moment, and she's been dying to read something on my kindle, you can just imagine how thrilled she is to have a whole collection of stories downloaded for her! And I love that these books are all free! Understood Betsy is my favorite book! Was so glad to see that someone else had heard of it! We book nerds must stick together, right? Understood Betsy was also one of my favorite books as a child. I still have the 1919 edition that my aunt gave me ( the book that she read as a child! I am looking for a collection of Children’s short stories that I read as a child in the 40s. The book was my grandmothers and probably was read by my mother, born in 1920. The illustrations I recall vividly, they had 2 colors, green and orange and black and white. I remember several of the stories – one about a Prince named Hal who made his mother the Queen a gift of a box planted with seeds. There was another story about Fireflies. There may have been another story about a baker or a gingerbread man, but not the one everyone knows. They were charming sweet little stories. I’ve often looked in used book stores for this collection of stories but have never found it. Does any of this ring a bell? So, sorry that doesn’t sound familiar. My grandmothers favorite author was Thornton Burgess so my mom read all of his books to us. Old Mother West Wind is just a starting spot. Try them all.